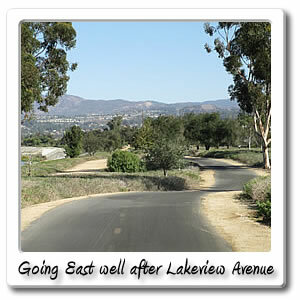 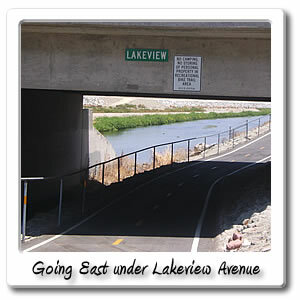 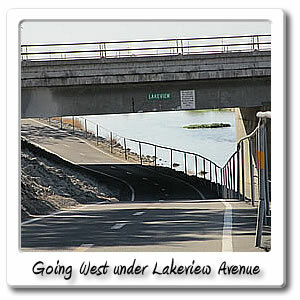 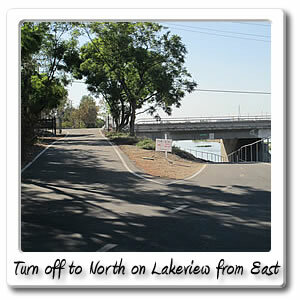 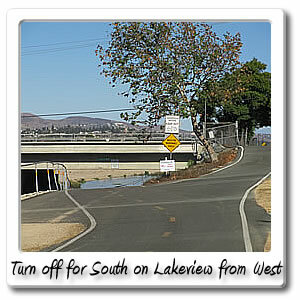 Welcome to Lakeview Avenue on the Santa Ana River bicycle trail. 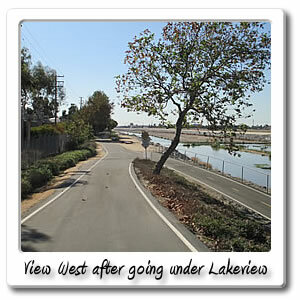 Just before the 19 mile marker is Lakeview Avenue 18.7 miles, 1 hour 34 minutes from the beach. 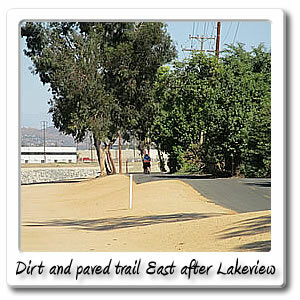 You're also 10.1 mi, 52 minutes from the end of the Orange County section on the Santa Ana River Trail. 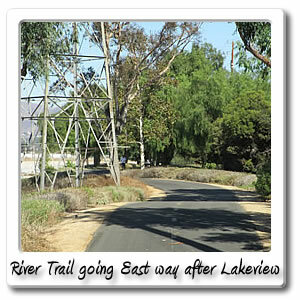 If you get off the Santa Ana River Trail, and go north for .3 miles and 2 minutes you will be at La Palma Avenue, in the City of Anaheim, there you will find Tom's Place, Bank of the West, and medical marijuana dispensary by the name of Pharmer's Choice, that's located in the big blue house on the corner. 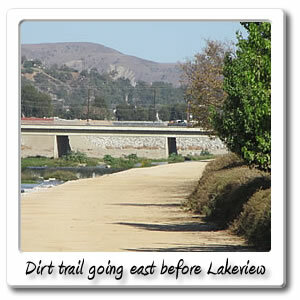 Once getting off the Santa Ana River Trail and going north for .8 miles and 4 minutes, you'll be at Orangethorpe Avenue, and you can find a Jack in the Box, Flame Broiler, Shell gas station and a cafe. 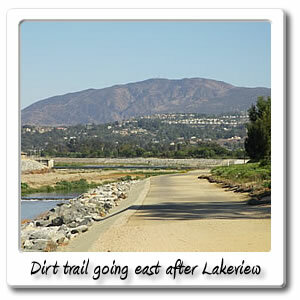 If you go north for 2.3 miles and 14 minutes is the Yorba Linda bike and horse trail. 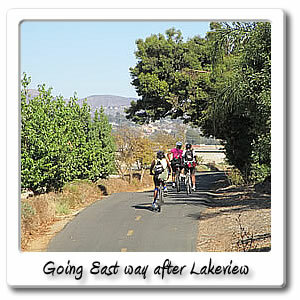 By getting off the Santa Ana River Trail, and going south for .2 miles and 50 seconds you will find a Mobil gas station with food mart, Steer Inn, liquor store and Kaiser Permanente Hospital. 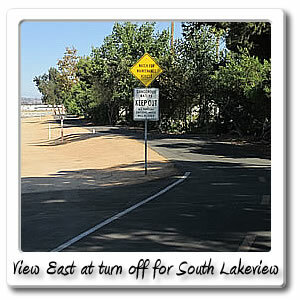 By going south on Lakeview Avenue, and going .4 miles and 3 minutes through the City of Anaheim, then .7 miles and 4 minutes east on Santa Ana Canyon Road, then make a left on Pinney Drive, and you'll see 21.4 acre Peralta Canyon Park, which is located at 115 North Pinney Drive, in the City of Anaheim and has restrooms, drinking fountains, playground, bbqs, football/soccer area, volleyball/ basketball courts, covered picnic areas, with benches and lighted baseball field. 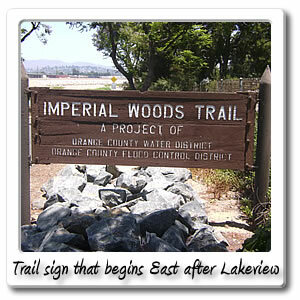 It is named for Juan Peralta, one of the first landowners in the area. 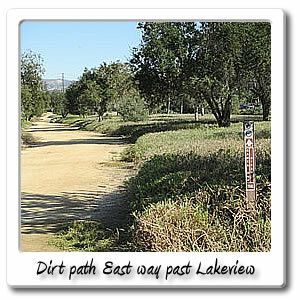 Don't forget to check out the Imperial Highway page, for directions to the Peralta Adobe that was built in 1871, using mud and hay.